What are the Carbon Canaries? 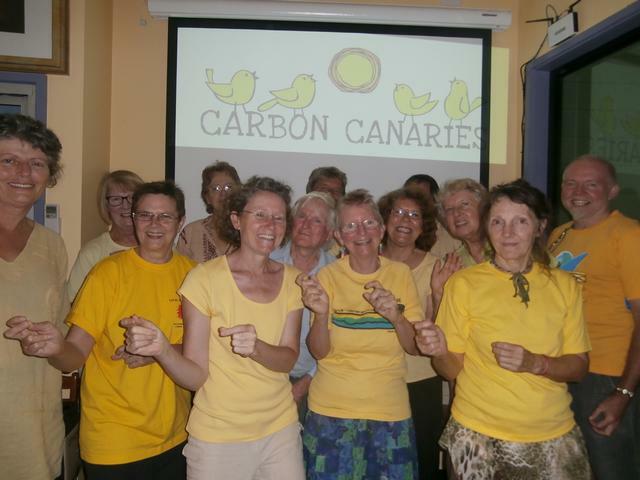 The Carbon Canaries are passionate about communicating the climate change message through song, and the louder we are the better. Great voice not necessary, joy in singing out with a group of like-minded people definitely is! Why have the Carbon Canaries? We need a new way to connect with people on climate change that tackles the serious issues but at the same time lets people to come together with joy and energy for a common cause. So we are going to sing about it and ask others to sing along with us. It definitely could catch on. Do I need to be an experienced singer? No, the Carbon Canaries are a community singing group, not a formal choir. Everyone is welcome and the more the merrier to get the climate action message out there. A Carbon Canaries information evening will be held from 7-9 PM on Monday 3rd of February at Nambour Community Centre (2 Shearer Street, Nambour). To register for the event or to find out more about the Carbon Canaries send an email to climateaction@scec.org.au and we will be in touch. Let’s join voices to send the message loud and clear that we want action on climate change. The inaugural meeting of the Carbon Canaries Sun 19/01/14 at Maleny Community Centre.